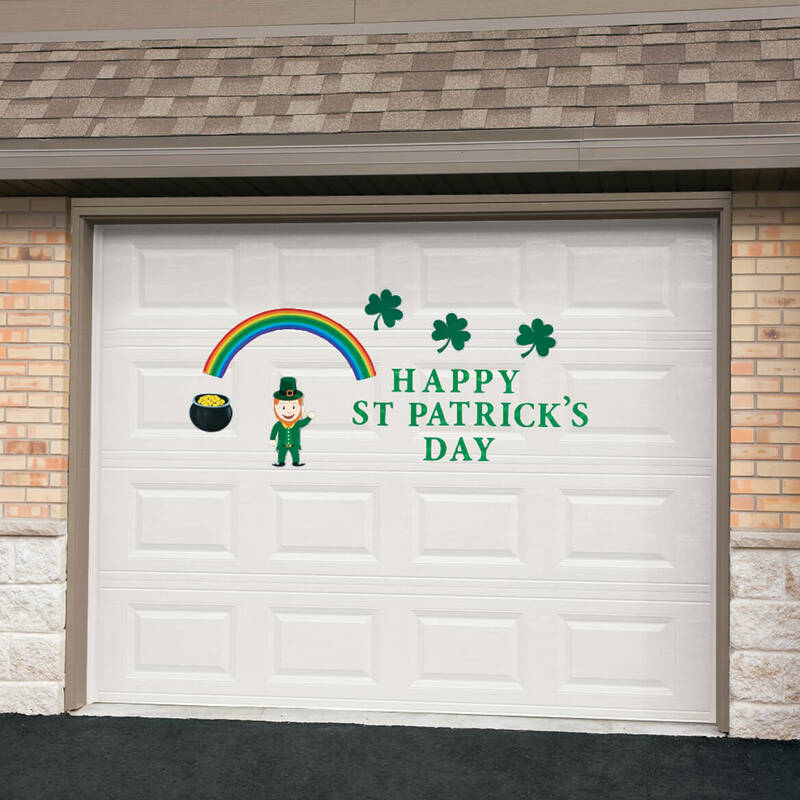 St Patrick’s Day garage door magnet set decks out your garage door in minutes! Our colorful garage door magnets make Irish eyes smile! Sending “Happy St. Patrick’s Day” greetings, the 26-pc. set includes weather-proof plastic letters (4″ high), shamrocks (8″ high), rainbow (19″ wide x 3 3/4″ high), pot of gold (7″ high) and lucky leprechaun (15 1/2″ high). Magnetic backs secure to metal garage doors for bright, EASY decorating! 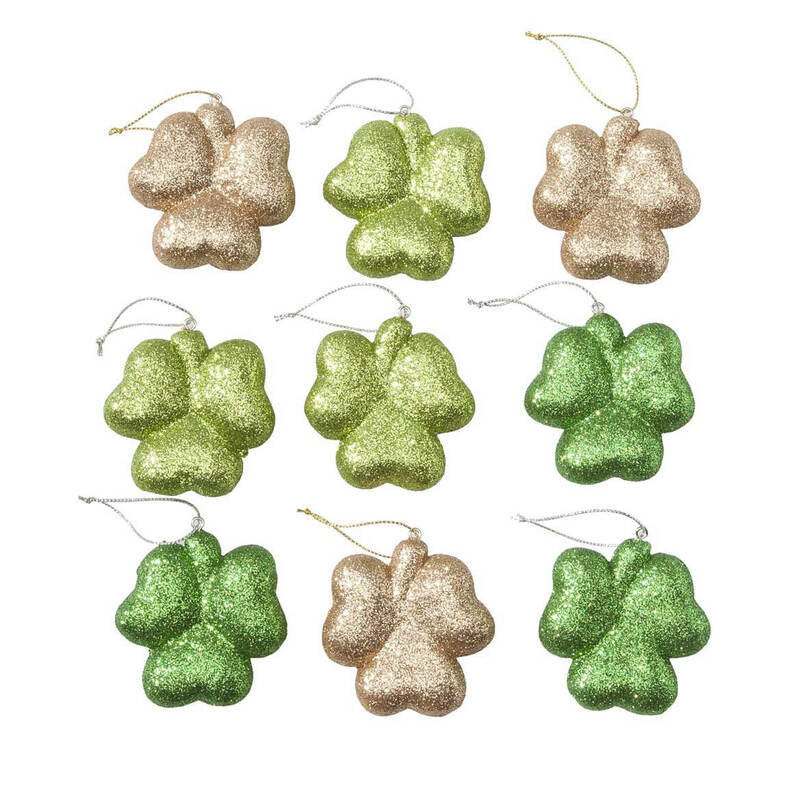 Add Irish sparkle to your home for St. Patty’s Day with our shimmering St. Patrick’s Day ornaments! Beautifully transforming our All-Season Tree (sold separately) to an Emerald Isle treasure, the glittering holiday ornaments dazzle in two shades of green and lucky Irish gold. Also fun when hanging from a chandelier, doorway, centerpiece, mantel or wreath, the durable styrofoam ornaments include attached hangers for easy display—creating Irish magic, year after year! 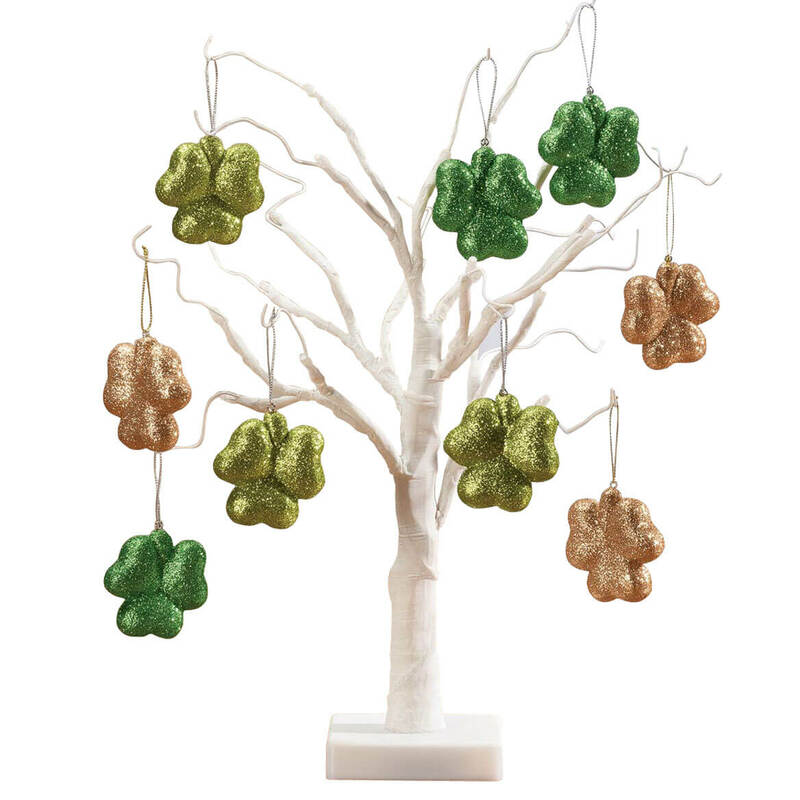 Set of 9 St. Patrick’s Day decorations includes 3 dark green, 3 light green and 3 gold shamrocks. Each, 2 1/2″ long. Sparkling with white LED lights, this year-round tree celebrates every holiday! Pre-lit with 18 LED lights on bendable branch ends, it features on/off switch and timer (sets for 6 hours on/18 hours off). Uses 3 AA batteries (not included). 18″ high. Ornaments are plastic, wire, polyester. 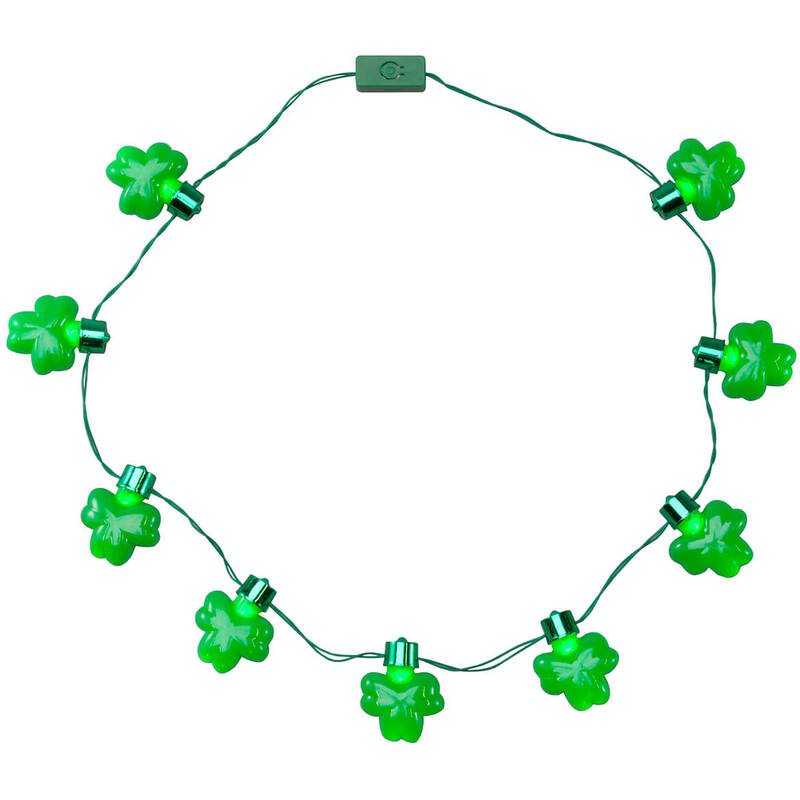 For puttin’ on the green and stealing the scene—glow BIG in this jumbo shamrock lighted necklace! There’s no hiding your Irish pride when you wear this light-up clover necklace with 9 jumbo shamrocks that dazzle in 3 flashing modes (fast rotating flash, slow rotating flash and constant on). You don’t have to be Irish to enjoy the style on St. Patrick’s Day! Each shamrock is approx. 2″ long x 1 1/2″ wide; shamrock necklace is 36″ long overall. Plastic. Ages 14 and up. SMALL PARTS. Not for u003c 3 yrs. 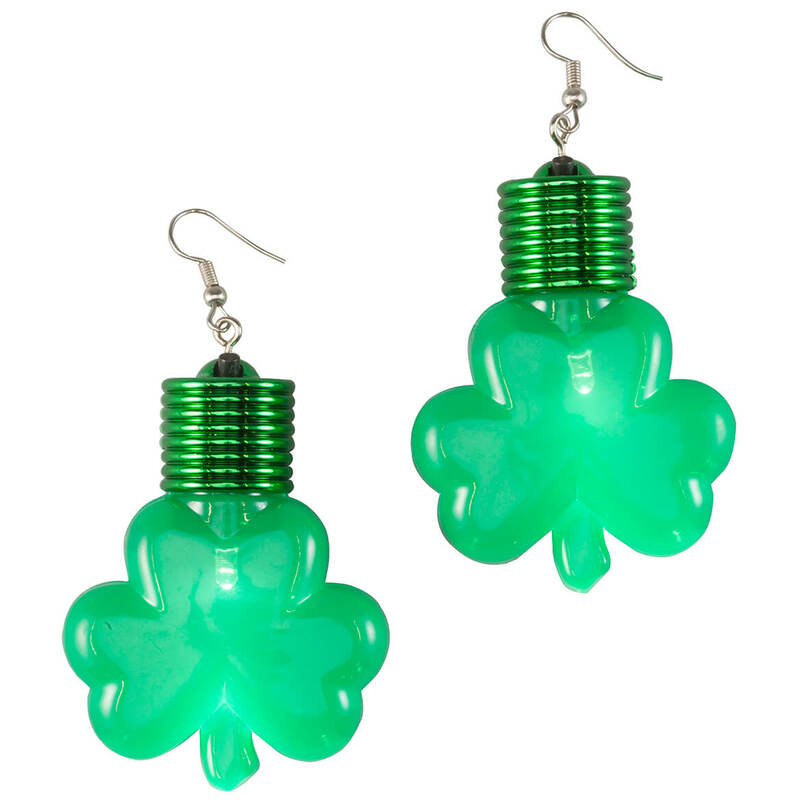 Shining with super-bright LED lights, these super-size shamrocks give you bright Irish style in a flash! 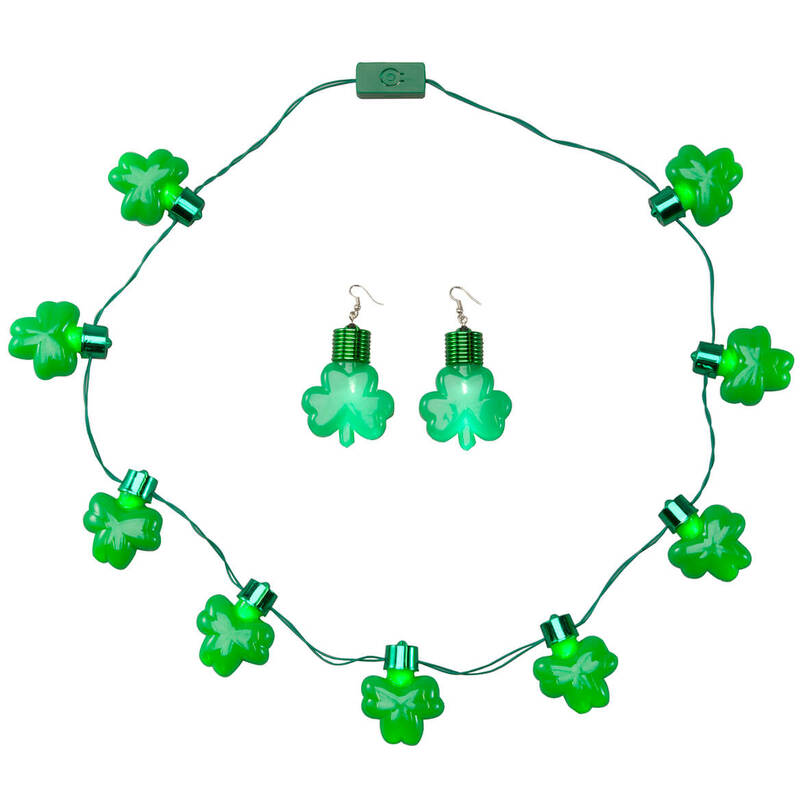 Fun for St. Patrick’s Day or any day, each jumbo shamrock lighted earring features an on/off switch and 3 flashing light modes (fast flash, slow flash or constant on). Styled with silver-tone french wires, the pierced shamrock earrings measure 2 1/4″ long x 1 3/4″ wide and include lithium cell batteries (non refillable). Plastic, metal and electronic parts. Ages 14 and up. SMALL PARTS. Not for u003c 3 yrs. Double your flashin’ fashion on St. Patrick’s Day with our jumbo shamrock necklace and earrings! Necklace with 9 large shamrocks and matching earrings both dazzling in 3 dazzling flash modes (slow flash, fast flash, constant on). Each shimmering jumbo shamrock measures 2 1/4″ long; necklace is 36″ long overall. Pierced shamrock earrings feature silver-tone french wires, and include lithium cell batteries (non refillable). Plastic, metal and electronic parts. Ages 14 and up. SMALL PARTS. Not for u003c 3 yrs. 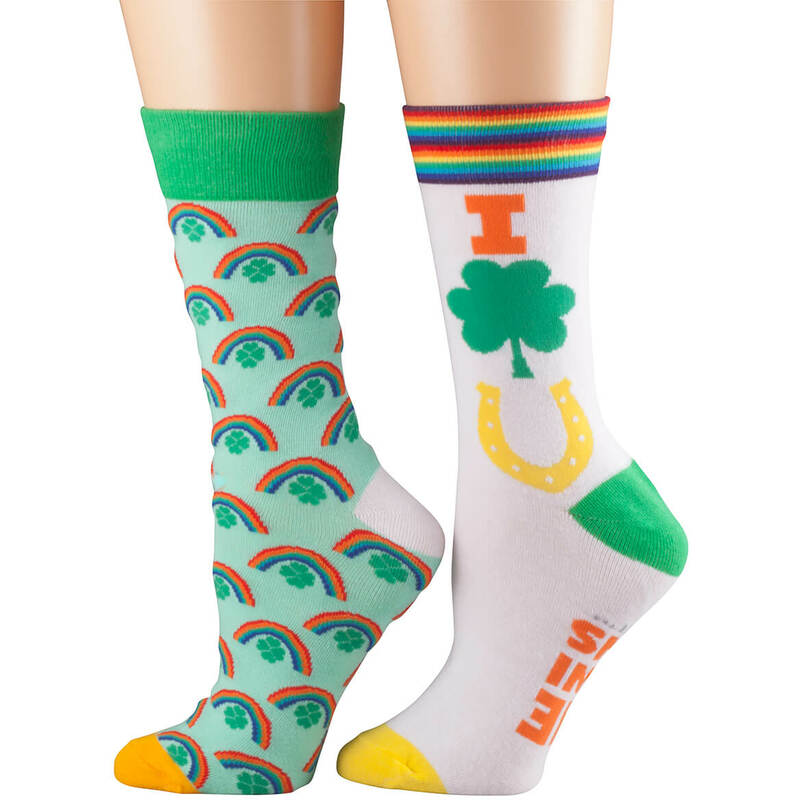 Donning bright lucky charms and Irish rainbows, these Lucky Charm and Rainbow Socks are perfect for St. Patrick’s Day or any day! Boasting quality design that’s made to last, the premium unisex socks feature extra comfortable heels and toes … treating lucky feet to all-day ease (whether you’re Irish or not!). One size fits women’s 5 1/2-9 1/2; men’s 5-8. 75% cotton/20% polyamide/5% elastane; machine wash cold, tumble dry. Set of 2 includes 1 pair each: Lucky Charm and Rainbow design. Imported. 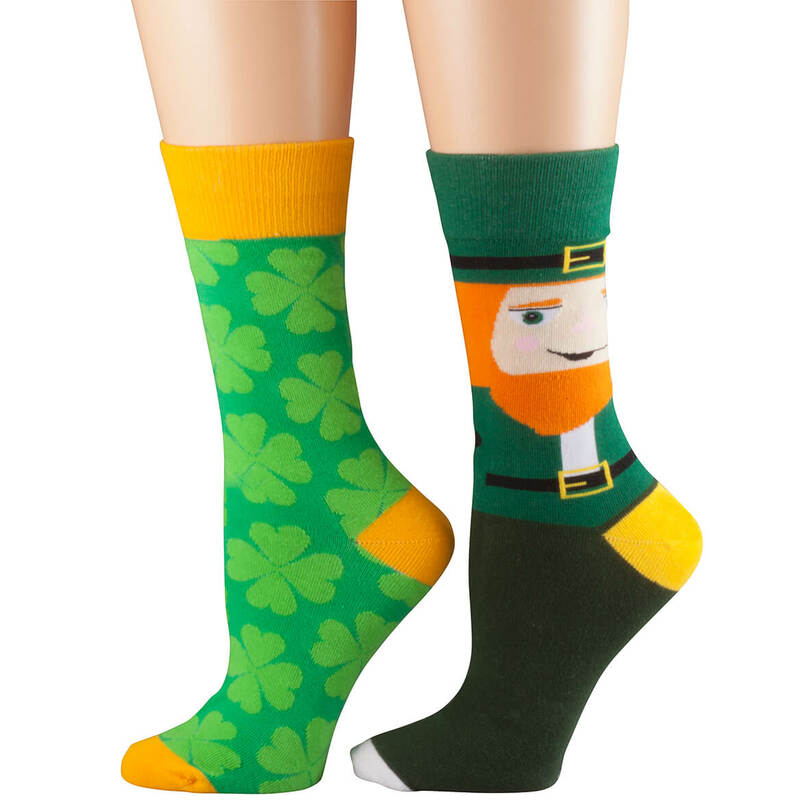 Treat your feet to bright Irish style with our lucky leprechaun and shamrock socks … and enjoy comfort and quality you’ll love wearing year round! Designed with extra comfortable heel and toe, the festive novelty socks are made to last, and perfect for St. Patrick’s Day parties or everyday fun. Unisex socks; one size fits women’s 5 1/2-9 1/2; men’s 5-8. 75% cotton/20% polyamide/5% elastane; machine wash cold, tumble dry. Set of 2 includes 1 pair each: Leprechaun and Shamrock design. Imported. 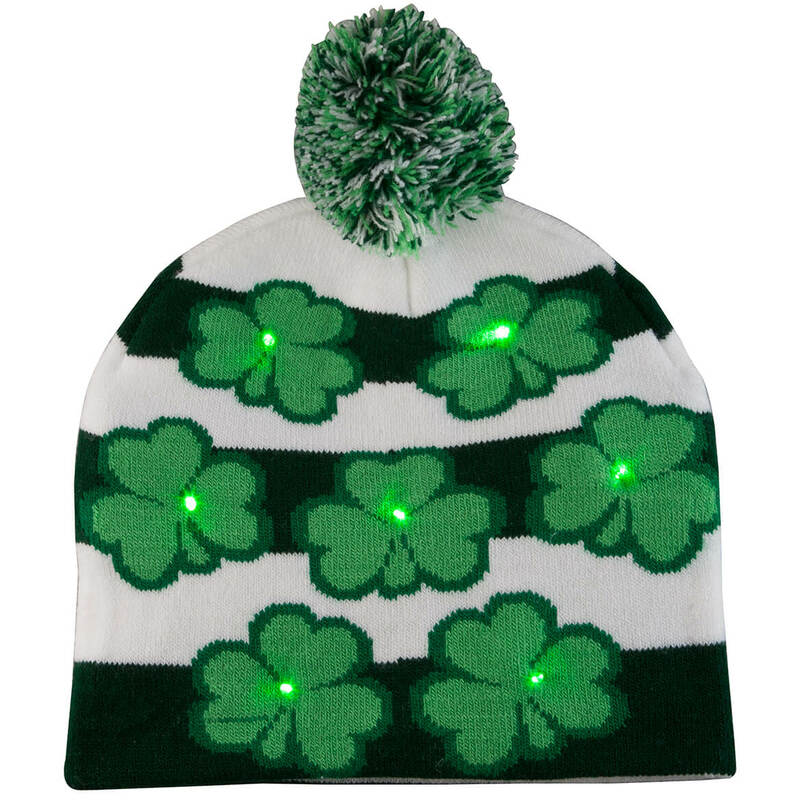 Lighting up for St. Patty’s Day fun, this St. Patrick’s Day lighted knit hat’s lucky shamrocks feature real flashing lights—glowing in your choice of 3 magical modes! Fun for parties, parades or everyday sparkle, the St. Patrick’s Day hat’s 7 LED lights shine in fast flash, slow flash and constant on. Featuring green and white stripes with shamrocks and a pom-pom, the lighted knit hat includes on/off switch and button cell battery (non replaceable). Acrylic, electronic components; spot clean. St. Patrick’s Day apparel measures 7 3/4″ dia.x7″ long (9″ long with pom); fits adults and kids ages 8 and up. SMALL PARTS. Not for u003c 3 yrs.